Mixing things up a bit, I thought I’d start off the new year without a game program. Instead, January’s program is Computer Talk, or Comp. Talk for short. Comp. Talk is one of several educational programs I wrote for reasons I’m not entirely sure of. Perhaps it was just the thing to do back in then. Many computer books, especially those that taught programming, had a mix of program genres. Whatever the reason, I wrote Comp. 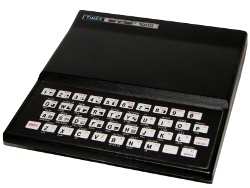 Talk as a way for the ZX81 computer to introduce itself and show a bit of what it could do. Written in the first person, the program reads like pages in a book. The first page is the introduction along with a graphically representation of itself. The second page is more interactive, asking for your name, favorite color, and favorite number. Those elements are then merged into a fill in the blank story. Did you catch what the story is about? The third page lists a couple of programs to try. Yes, they do work. The fourth and last page closes out the program with some instructions and a cheeky afterwards. The four pages do a decent job of showing what the humble ZX81 could do. The code is straight forward, made up of basic PRINT commands. There isn’t any tricky coding here. If you didn’t notice, I used commas and TAB to avoid having to deal with calculating the size of the variables used for the story. It is a cheat that can easily be broken, but for most entries does the job nicely. It is the code one would expect. The code is easy to understand and, as it instructs later, something you can list and learned from. Funny thing about this program, I never showed it to anyone before now. Whoever I had in mind to educate, it really only served as a vehicle to educate myself. Perhaps someone will come across this and find value in it, but I doubt it is worth more than a footnote in history. Though, if you are reading this, you’ve already proven me wrong.